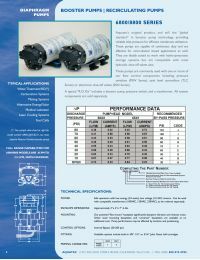 Aquatec 8800 Series Pumps are used in RO systems with flow rates from 100-200 GPD. Reverse osmosis systems require pressure to work properly. A booster pump is suggested for applications where the feed water pressure is low, and where there are high levels of Total Dissolved Solids (TDS) in the water. The 8842-2J03-B424 is designed for operation with a transformer and tank shut-off switch (PSW), which shuts off the RO booster pump when the storage tank becomes full. In under-counter RO systems the PSW can be coupled with an Electronic Shut-Off valve (ESO) in order to shut off the feed supply so the system does not waste water. Reliable Performance. The Aquatec 8800 Series Pump is an extremely durable booster pump that is designed for continuous duty. This tough pump is safe to operate with low voltage for long lasting reliability. The Aquatec 8842-2J03-B424 pump is certified to NSF standard 58. The Aquatec 8842-2J03-B424 pump is proudly made and manufactured in the USA.